File photo of Taliban fighters in Afghanistan. An official Taliban statement on August 1 denied reports by Pakistani media that the founder of the Haqqani network -- a militant group affiliated with the Taliban and Al-Qaeda that is blamed for some of Afghanistan's deadliest suicide attacks -- died about a year ago. Multiple credible Taliban sources had earlier told RFE/RL's Radio Mashaal, the Dawn newspaper, GEO-TV, and other Pakistani media on July 31 that Jaluluddin Haqqani died in 2014 from an illness and was buried in Afghanistan's southeastern province of Khost near the border with Pakistan. Haqqani, in his 70s, is known to have been in ill health in recent years and has given up most of the day-to-day control of his militant network to his son, Sirajuddin Haqqani. The August 1 Taliban statement, which appeared on an official website of the militant group, said the reports of Haqqani's death had "no basis." It said: "Haqqani... was ill before but he has been blessed with good health for a prolonged period now and has no troubles currently." Several family members interviewed by the Reuters news agency on July 31 insisted that Haqqani was still alive. One close relative said that he "no doubt, has become aged and suffering from different diseases." But one family member told Reuters that the reports of his death were true. That relative said Haqqani died in early 2013 of a brain hemorrhage and was buried in the Zadran area of Khost Province. The reports of Jalaluddin Haqqani's death came a day after the Afghan Taliban confirmed the death of its leader, Mullah Mohammad Omar, saying he died "some time ago due to an illness." His death has exacerbated divisions between rival factions of the militant group. Commanders who support Mullah Omar's 26-year-old son Yaqoob have rejected a Taliban statement proclaiming Mullah Akhtar Mansur as the movement's new leader. The Haqqani network operates on both sides of the Afghan-Pakistan border. It became affiliated with the Taliban after they captured Kabul in 1996 and assumed de facto control of Afghanistan. 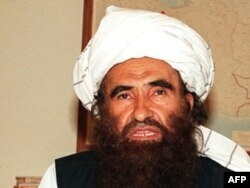 Jalaluddin Haqqani was the Taliban regime's Minister of Tribal Affairs. He fled to Pakistan after the U.S.-led invasion of Afghanistan in late 2001 and the overthrow of the Taliban government. Many experts believe Haqqani and his militia fighters also helped Al-Qaeda leader Osama bin Laden flee from Afghanistan to a safe haven in Pakistan in late 2001. Haqanni's militant network originated in Afghanistan during the mid-1970s and received support from the United States and Pakistan's ISI intelligence service during the 1980s Soviet war in Afghanistan. Osama bin Laden was recruited by Haqqani as a foreign fighter in Afghanistan, where he received training to battle the Soviets. In fact, the Haqqani network's ties with Al-Qaeda date to the founding of Al-Qaeda. But while the Salafist goals of Al-Qaeda are global in nature, the Haqqani network's agenda has been focused only on Afghanistan and the Pashtun tribal regions of Pakistan. Haqqani's son, Sirajudin, is listed by the United States as one of the most wanted terrorists in the world. Washington has offered a $10 million bounty for his capture.